Bridges has been a landmark on Vancouver’s waterfront for 30 years. 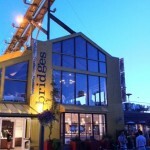 Located next to the Public Market on Granville Island, Bridges offers lovely views of the ocean, mountains and city. 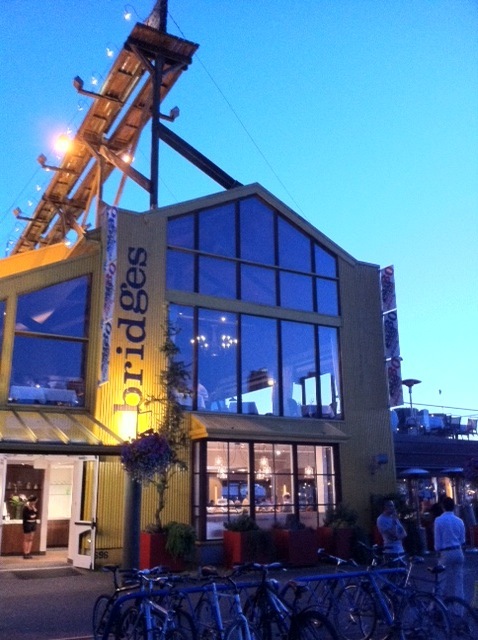 Bridges, a restaurant, bar, bistro and outdoor dining area, is the quintessential Vancouver experience and unique in that it is easily reached by water (serviced by public moorage, Aquabus, and False Creek Ferries). Granville Island also provides some free parking stalls for easy car access. It’s hard to miss the bright yellow building, with its large patio right on the water. There was a queue for patio seating, so instead of waiting in-line we snagged a table of four right beside the floor to ceiling open windows – so it felt like we were dining outside. We ordered some drinks and while we were waiting for our friends to arrive, we also ordered an appetizer to tide us over. 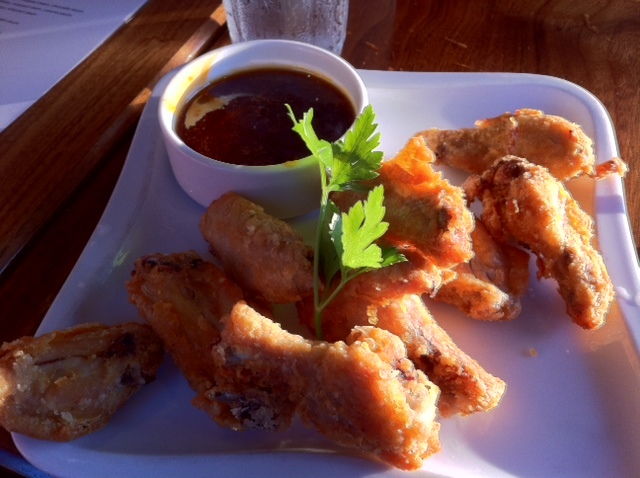 Crispy Chicken Wings ($12) – Lightly battered and deep-fried mini chicken wings with a honey garlic chili dipping sauce. These were tasty little guys, but there were only approximately nine wings on the plate. Spinach Salad ($13) – Baby spinach leaves with candied pecans, fresh berries, fresh strawberries, tossed in a maple balsamic vinaigrette. 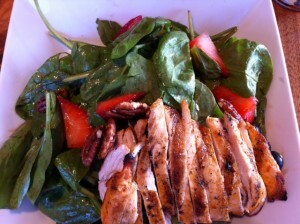 I added a grilled chicken breast ($6) to attempt to turn my dish into a meal. Although my salad was good, it was a small size for dinner. 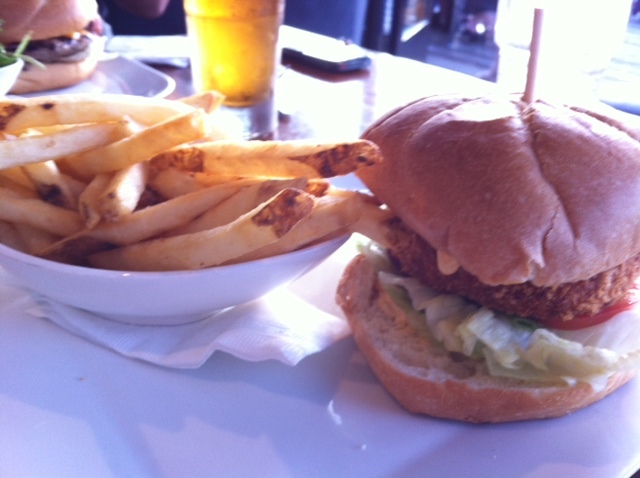 Crab & Halibut Cake Burger ($19) – Battered and deep-fried crab and halibut patty with chili lime mayo, lettuce, tomato, and served with fries. We weren’t expecting the patty to be battered and deep-fried, so it might have been wise to order a salad in lieu of French fries with this dish. 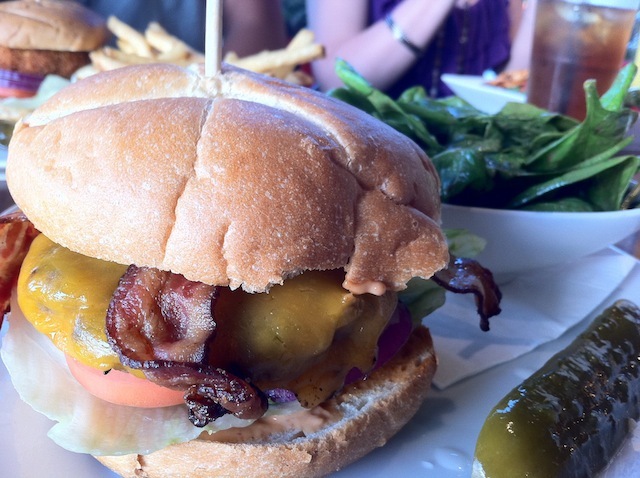 Bridges Classic Burger ($17) – Beef patty with melted cheddar cheese, crispy smoked bacon, served with a side spinach salad. Overall a decent burger, but again expensive for what it was. Overall, Bridges is an lovely spot on Granville Island to sit and enjoy the views of the waterfront. However, since it’s a tourist spot, food is overly-priced and nothing to rave home about. It appears as though the majority of their clientele are tourists, so I’m assuming our server was not concerned about repeat customers and therefore didn’t care to provide adequate service. Although she was friendly, she neglected our table the entire evening, and we were required to chase her down to obtain our bill. When you have guests visiting from out-of-town, I’d recommend enjoying drinks at Bridges for the wonderful view – but dine elsewhere.